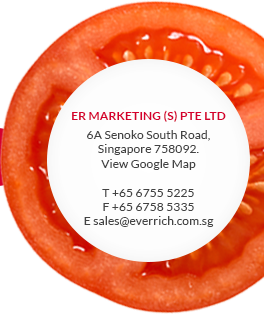 ER Marketing (S) Pte Ltd - One of the Biggest Importer and Exporter of Food Products in Singapore. ER Marketing (S) Pte Ltd was established in year 2003. We provide a wide range of food products such as raw condiment, fruits and vegetables for wholesale and retail business. ER Garlic, ER Onion and ER Potato are the main products that we carry. We offer over 50 different types of food products to cater our customers’ needs and preference. ER is one of the biggest importer and exporter of food products in Singapore. Wholesale of food is our core business. We strive to serve our customers consistently with a competitive price and high quality products. It’s our responsibility to ensure our customers receive quality services and products. This has been our core value ever since we started our business. Besides that, we have over 10,000 square ft of cold rooms that can accommodate 1500 tons of products. Our warehouse also provides 18,000 square ft for products storage in bulk. In addition, we supply to Supermarkets and many of the local food factories that are well known in Singapore. We are also located in the Food Zone Area, which is an ideal situation. Our company is using a computerized system that can provide an accurate statistic report for each customer’s monthly usage. Therefore, we are able to ensure that our products quantity meet their requirement. Packing weight, origin of country, product and price are clearly stated on the issued invoices. Moreover, the employers in our company have more than 45 years experience in supplying food products in the local or international market. Feel free to browse through our website and share with us your enquiry or feedback. We will submit our high quality products, competitive prices and best service for you.